Xita Records was created in 2015 in Lisbon as a collective and publisher based on the friendship of the young musicians who wanted to form it. From Primeira Dama’s pop to Kerox electronica or Veenho and Ninaz garage rock, Xita has been demonstrating its main common goal: to excite people. To start off the night, Tomás Varela will bring his songs in a “samba from Restelo” about what his youth is all about. Right after that, will have Lucía Vives and her bedroom pop that we can all sing along to. Meanwhile, CAIXADURA, Xita’s latest electronic duo, take their PCs and synthesizers to the bathrooms to make it impossible to avoid their beats and stand still in an unprecedented format. 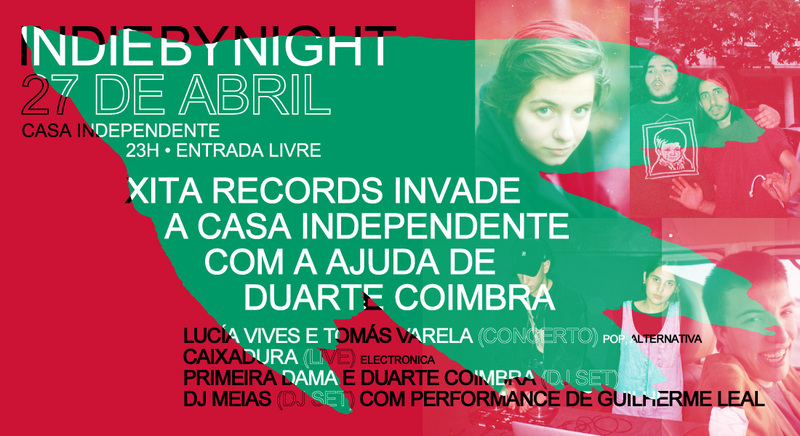 Throughout the night, Primeira Dama invites Duarte Coimbra, a long time friend and director of Amor, Avenidas Novas, for a back2back DJ set to celebrate everything that happened this last year, their shared friends and experience in the city of Lisbon as artists. Finally, DJ Meias (Leonor Barroco and Tomás Queiroz) will take the night by storm with a wide rang of musical styles, from funk to techno and pop 00’s to samba songs.